Before describing the operation of the device as a whole will focus on one of its constituent elements — the Converter of the spectrum of the electrical signal, or “FUZZ”device. To To obtain this effect, it is necessary to enrich the original signal a large number of odd harmonics. There are several ways, and thus the schemes to achieve them. We will stop at the spectrum Converter, which is a ULF with parapremium. 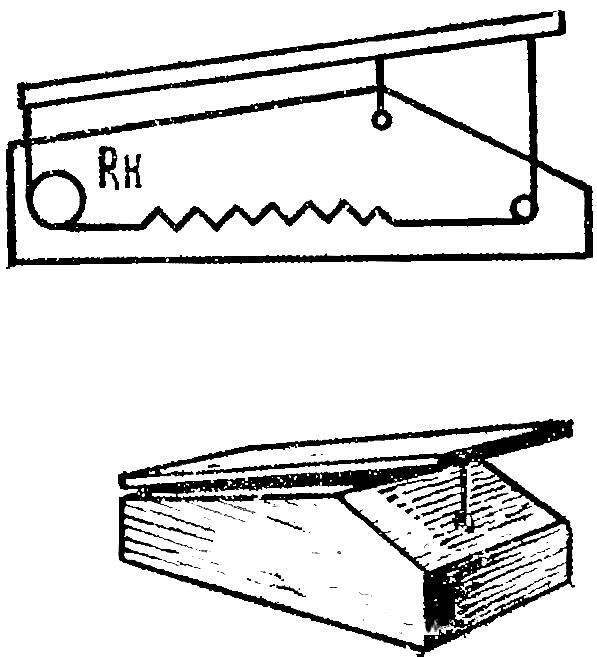 The simplest diagram of the “FUZZ”-the device shown in figure 1. ULF with two-stage high pressure ratio limit signal for the maximum and minimum. “Pure” sine wave is distorted. Increases the number of odd harmonics. The guitar takes on the most various shades, imitating the “votes” reed and stringed instruments, or synthesizing completely new, “electronic” sounds. The scheme requires virtually no setup. However, it has one feature: it should be used with transistors In > 150. The device is best to check with a sound generator and oscilloscope. 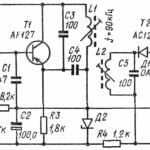 On the circuit”s input from the sound generator are sinusoidal signal with a value of about 25 mV. The base of the transistor V2, the signal is close to rectangular, and the output it has the form (oscilloscope) wrong distorted sine wave. 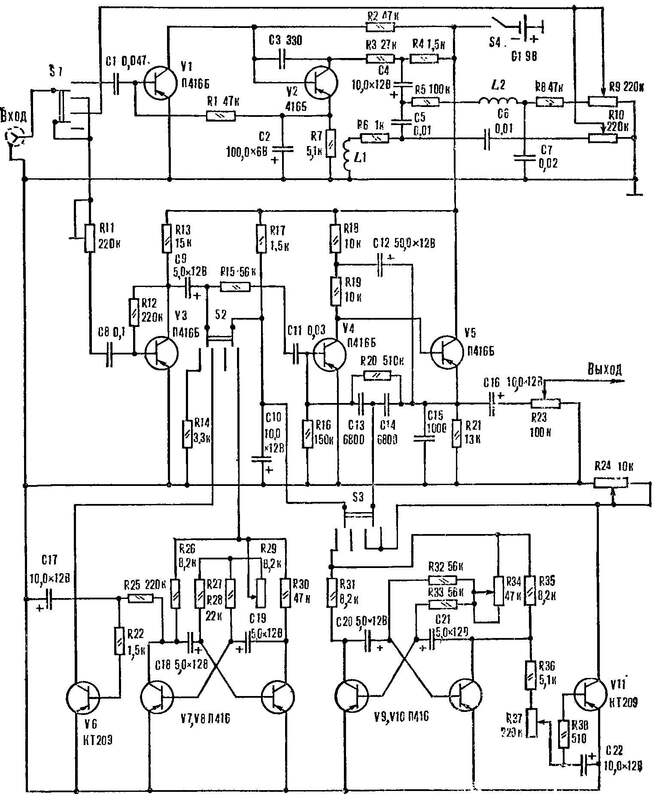 Connecting an electric guitar via a transducer of the spectrum to the amplifier through resistor R2 select the desired duration of the sound, making sure that it is not stopped, and faded gradually. Resistors R6 and R7 equalize the volume of “pure” and transformed sound. Common concept prefixes is depicted in figure 2. The device is assembled in the housing made in the form of a foot pedal. Diagram of the console consists of four separate functional blocks. Transistors V1 and V2 collected “FUZZ”-block. Turn it on the toggle switch S1. Resistors R9 and R10 — volume control respectively high and low frequencies. As the inductors L1 and L2 we can take the universal head off any vacuum-tube tape recorder. 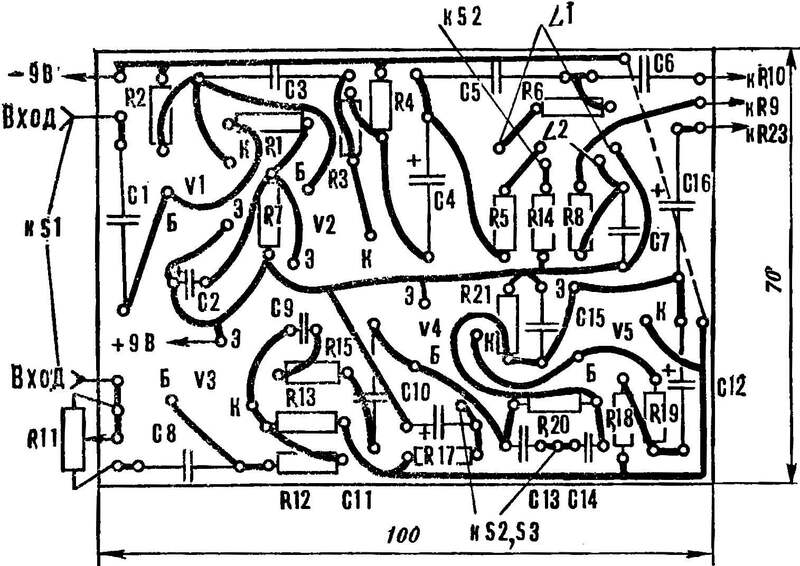 The device is “wow” collected on the transistors, V3 — V5 (see “M-K” № 3, 1980). 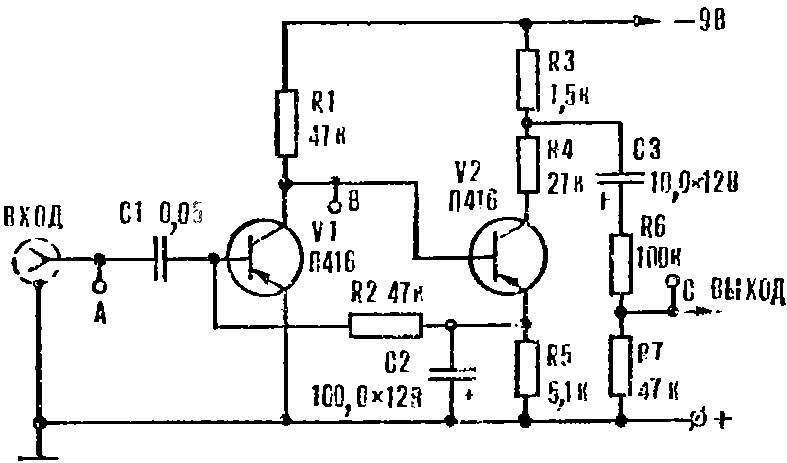 Adjustable element of the tunable RC filter acts as a variable resistor R24 group “B” (with logarithmic dependence of the resistance). 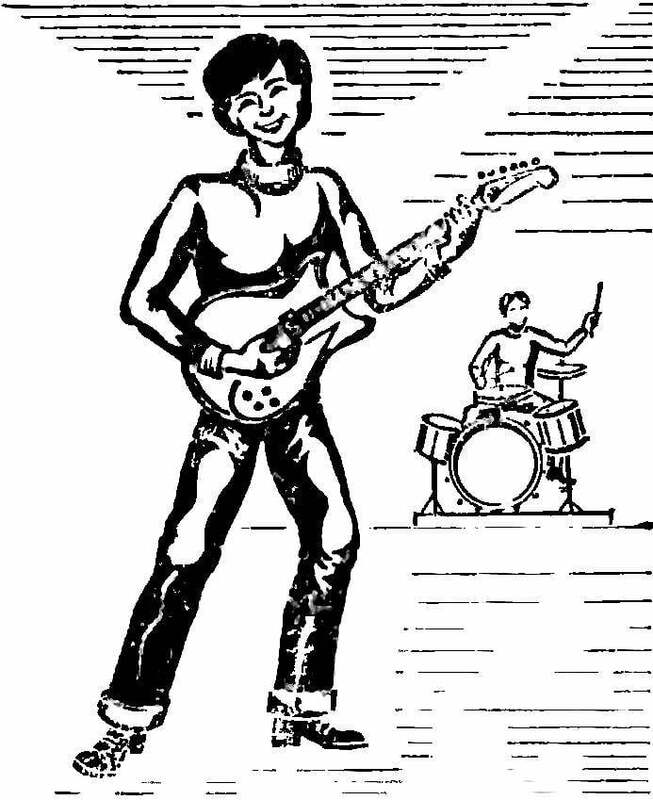 A fixed resistor R11 limits the signal of an electric guitar up to 45-50 mW. Block “Vau” is always enabled and operates a foot pedal (Fig. 3). Transistors V7, V8 and V9, V10 are assembled with two identical symmetrical multivibrator. 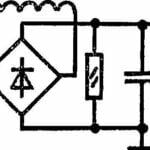 They produce an alternating voltage of low frequency changes with a certain frequency internal resistance (the transition collector-emitter) of transistors V6 and V11. By using toggle switch S2 V6 is cascade connected to the output of the preamplifier V3. The change in the internal resistance of the transistor V6 (frequency is set by potentiometer R29) leads to a periodic change of the amplitude of the signal with the same frequency. This is the amplitude “vibrato”. The selection of resistor R25 adjusts the modulation depth. The second multivibrator works in a similar way and is used to obtain the effect “vibrato” T (timbre). Unit is turned on by switch S3 controlled by a pedal. A variable resistor controls the frequency R34, and R37 — modulation depth. The frequency varies in the range of 3-15 Hz. Note that to get a specific sound effect transistors V7, V8 and V9, V10 should have pairwise identical and quite high (=100) gain. 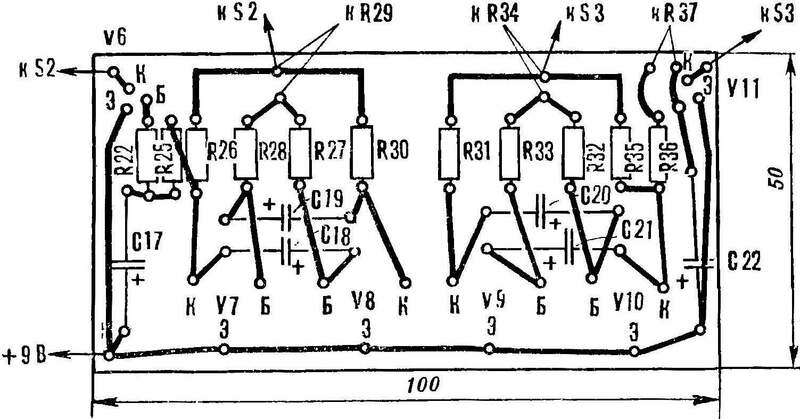 The transistors V6 and V11 — silicon КТ208 or КТ209. If at the same time to enable “vibrato” and timbral “vibrato” amplitude with the frequency of each oscillator 10-12 Hz, with the relative variation of both frequencies by 5-10%, it is possible to obtain the effect that is perceived as “flying” sound. The console is mounted on two printed circuit boards (see Fig. 4, 5) made of foil fiberglass or Micarta thickness of 2 mm.